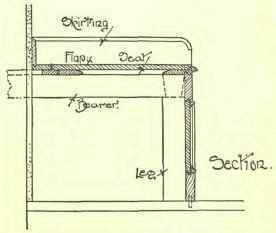 Where it is desired to form a cupboard in a recess it is sometimes done by closing the opening with framing, in which a door is hung, either carried right up to the ceiling or stopped at a convenient height and covered with a top. 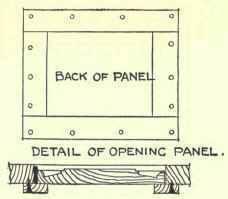 This is, however, not a method to be recommended, as it is much better to have the recess properly lined with boarding, matched or plain, secured to the wall, or a complete cupboard formed to fit the recess. 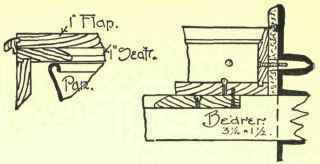 In this case the back and sides would be formed of matchboard-ing, grooved, tongued, and either beaded or V-jointed; or of plain boarding, grooved and tongued together. The front should be framed, and hung with a single door if it be less than 3 feet in width, or with folding doors if more than that width. Fig. 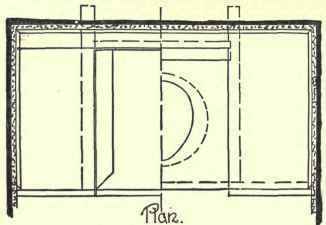 146 shows the plan, elevation, and section of a cupboard of this description. The door is a four-panel one. 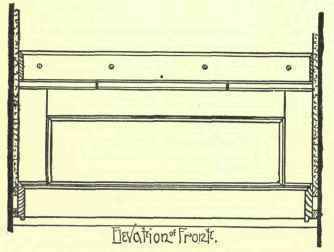 Moulded outside, with panels flush on the inside, hung in framing consisting of side posts and head, which are tongued to side linings and top. If required for a hanging cupboard, hooks may be screwed to the lining; if with shelves, these are carried on bearers secured to the sides as shown. As it occasionally happens that more room is required than that provided between two shelves, it is a good plan to have the selves cut to exactly fit the opening but not secured, so that any of them may be temporarily removed if desired. A finish is provided by an architrave, which should match that round the room door, and be secured across the top by means of angle blocking. On one of the bedroom floors there should be fixed a linen cupboard, and, if possible, it should be in close proximity to hot-air or hot-water pipes, so that its contents may be kept as dry as possible. If the hot-water cylinder or other means of warming be introduced into a lined cupboard, it must be well ventilated by means of holes near the bottom and top, so as to provide proper circulation of air and allow any steam arising from damp clothes to escape. If there be room, it is advisable that such a cupboard be provided with rails, on which clothes could be hung, these rails being made out of broom handles. As a linen cupboard does not as a rule stand in a recess, one on both of its ends will be exposed. They must then be panelled to correspond with the front. The general method of construction would be similar to that illustrated in Fig. 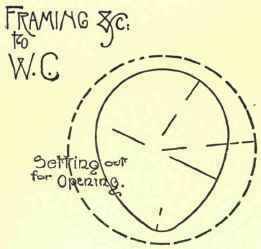 146, except that the framing should be stouter, out of 2-inch or 2 1/4-inch stuff, and an independent floor should be fitted. It should be finished with a moulded plinth and cornice. The corners should be bull-nosed and fitted as shown in Fig. 147. 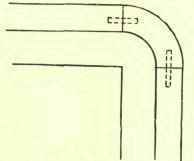 The quadrant corners of the cornice being formed separately and butted, dowelled, and glued to straight lengths, as shown in Fig. 148. Fig. 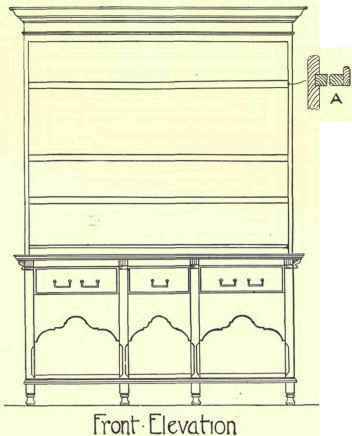 149 shows a front and side elevation of a typical dresser, fitted complete with drawers, shelves, etc., and with a large open space beneath the former. A similar open space beneath the lowest shelf is not often provided, but when this is boxed it only-forms a place for dust to collect in, which would probably never be swept away, and is also likely to harbour vermin, etc. The detail at A shows the method of fixing the shelves by housing, while a small fascia bead spiked to the edge of each shelf and slightly deeper than the latter is provided to prevent plates from slipping off. 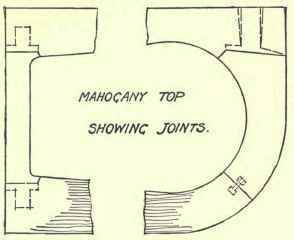 Where the bath is enclosed it usually stands in a corner of the room, so that one side and end only require covering with woodwork, the top fitting into the angle of the walls and being finished along the side and end next to the walls by a narrow skirting.